As my colleague Robin has illustrated in the past, Larry Cohen is an auteur of bizarro, idiosyncratic cult cinema. 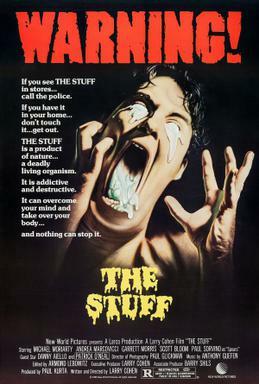 The Stuff is a serrated satire on food marketing with the premise of a Roger Corman B-picture where a sentient, Fluff-like material cannibalizes those who ingest its delicious substances. Without Cohen’s penmanship, it would be risible. With it, the film is screamingly funny. Michael Moriarty should’ve been a marquee character name ala Christopher Walken and Sam Rockwell. Moriarty’s slickster, good-ol’-boy performance as Mo Rutherford propels the film to outlandish heights before the high-concept premise kicks into top gear. He is magnetic when he jaunts through a yacht and counts the amount of “sweaty palms”. Later on, he casually punches a rival and glides out. Moriarty is a Cohen regular and occasionally his backstories overshadow the stakes at hand. For example, his matchstick man in Q blackmailing the city to profit from the creature’s presence, is a beautifully streetwise character study in the middle of a nature-run-amok movie. Similarly, when Mo states in an offhanded comment that he’s “off” alcohol now, we can’t help but be curious to his life beforehand. The majority of The Stuff concerns Jason (Scott Bloom) as he sabotages the edible product because he is the only one who believes the deleterious effects of the dessert. This storyline satiates the desire for an Invaders from Mars corniness but it’s probably a hook for 42nd Street grindhouse distributors. During which, the puppetry effects and composite shots of a white blob are awfully inadequate. Of course, the splotchy marshmallow visuals can be forgiven because of the flippant humor. Midway through the film, Rutherford is thrust into a mismatched buddy comedy with “Chocolate Chip Charlie” (Garrett Morris), a junk food tycoon whose hands are “lethal weapons”. One wishes the entire film revolved around them because their chemistry is impeccable. Possibly a precursor to Shane Black. The commercials for The Stuff are knee-slapping with simpering dancers prancing around in alleys in what could be the next Breakin’ movie. Cohen is a pungent social commentator and he skewers everything from dietary fads to misleading advertisements. At a brisk 87 minutes, The Stuff proves its tagline that “enough is never enough” when it comes to Cohen’s rapier wit. This entry was posted in Movies, Reviews, Robin's Underrated Gems. Bookmark the permalink.